"Anytime I played the Black Dog guitar, it sounded like music"
Body detail of Joe Satriani's Black Dog guitar, with artwork that could only from Satch's fertile imagination. Clapton's Blackie, BB King's Lucille, Neil Young's Old Black - sometimes a guitar is more than a guitar, it's a part of a guitarist's personality and thus it earns a memorable, even iconic nickname. Such is the case with a certain Frankenstein Ibanez guitar that then-rising star Joe Satriani received in 1987, one which would become a workhorse instrument for him through the years and a testing ground for his highly successful line of signature Ibanez models. It's the guitar we now know as the Black Dog, that diminutive six-string, recognizable not only for the quirky scribblings that its owner would enthusiastically apply but for its unique tone, by turns fat and crunchy, sweet and soaring. From the latter part of the '80s and well into the '90s, even as he perfected the art of guitar design and engineering with the Ibanez JS series, Satch used the Black Dog for all it was worth. "There was just something special about the Black Dog," Satriani says. "I remember [producer/engineer] John Cuniberti said it right. We were going to record something, and he said to me, 'That guitar sounds more musical than other guitars you have.' It was a very untechnical assessment, but it was the description that made the most sense. Anytime I played the Black Dog guitar, it sounded like music and less like the combination of pickups and wood." 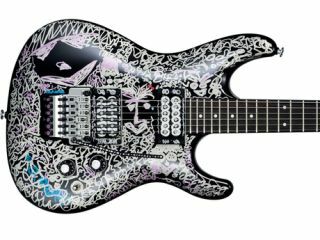 In 2008, Ibanez commemorated the original Black Dog guitar with the JSBDG Joe Satriani Black Dog Tribute model, a stunning limited-edition run that re-created every nuance of the axe that Satch played on some of his most famous albums and on stages across the world. Satriani sat down with MusicRadar to reminisce about the original Black Dog, recalling how it first came into his possession, its idiosyncracies, why it became such a go-to instrument and when he knew he had to retire his old friend. "My getting the guitar that became the Black Dog would have been in 1987. It came by way of Rich Lasner, who was then head of Artist Relations at Ibanez. When I was introduced to Ibanez through Steve Vai, Rich was the interface guy. Being a really great guitar player himself, Rich was a lot of fun to work with. We spoke the same language and zoned in on the technical aspects of the instrument, right down to the minute details. "The guitar originally came with a hum/sing/hum arrangement, but when it arrived at my place, Rich or somebody under Rich's direction had filled in the middle single-coil space with wood and refinished it in black. I think there were some new frets on the neck, too. I believe the neck was a Roadstar neck. So it was a 540 Radius body, hum/sing/hum arrangement with the middle pickup gone, hole filled in with wood, finished over, with a Roadstar neck. That's how we started." "Well, here's what happened: I had just finished Surfing With The Alien. This was back when we passed around cassettes and vinyl months before an album came out. The record had gotten some interest in the manufacturing community - strings, picks, guitars, stuff like that. Cliff Cultreri and Relativity Records were trying to get people to properly pronounce my name and to put a face to my music. Simultaneously, Steve Vai had sent me an Ibanez guitar because he was getting ready to do something with them, and he wanted my opinion on the workmanship. "I said, 'Hey, this guitar is great!' I loved the bridge. Up till then, my only other Floyd Rose-bridge guitar was a Kramer Pacer, which I had used on my first three records, the EP, Not Of This Earth and Surfing With The Alien. That guitar was just a wreck. It was always falling apart, I had changed just about everything I could on it - the whole bit. But the Ibanez guitars came out, and I thought, Hey, somebody is finally doing it right. "Steve said, 'Well, I'll talk to them and tell them who you are, and maybe they'll want to talk to you.' At the same time, Cliff had played them the record, and they said, 'Wow! Maybe we should make you something.' So by the time Surfing With The Alien had come out in October 1987, I had already received the guitar, and we were sending it back and forth and playing around with things. We were changing the profile of the neck and working on what became the compound radius formula for the JS line. And that was Black Dog. That thing had so many changes made to it." "At this point, I had already been introduced to Steve Blucher at DiMarzio. My guess is there were PAF Pros in both positions, but then the Fred pickups started showing up, so we went to a Fred in the bridge. I have a box full of Fred 1s, Fred 2s, Son of Fred - we just tried things. The funny thing is, I think we were trying to figure out how to work with this new gig that I had. "See, prior to '88, I had never really had an instrumental guitar gig; I never thought I would. Most of my guitars were set up to accompany singers. I think I had a Seymour Duncan Jeff Beck JB pickup in the Kramer, but sometimes I had a DiMarzio Super Distortion in it. Or maybe it was their classic PAF, and then maybe there'd be a Duncan Custom Custom. Like most guitar players, I was just trying to figure out the best formula. "By the time I realized, 'Wow, I'm going to have to stand in front of people and play instrumental music,' that's when I knew I needed a pickup that was a little more detail oriented for my job description. That's when we started with what became the Fred. "I wanted something that was unique, something that would go with this guitar, because the JS, which was born from the 540 Radius, was what you would call a 'smaller-bodied guitar.' It was not a Les Paul. That early Jeff Beck sound seemed to go really well with a Les Paul. Sometimes with Les Pauls, though, you're fighting too much size, and having that little bump in the midrange really helped him poke through and get this kind of vocal quality." Do you remember the moment when you were playing the Black Dog, whether it was at home or on stage, and it felt really right to you? When did you say to yourself, "I can do something with this guitar"? "It wasn't until a couple of months leading up to the release of Surfing With The Alien that I felt we had a couple of elements that were extremely important. We were still fighting the contours of the body and the cutaways that I didn't like. But I started to really enjoy where Rich and I had brought the compound radius. "Actually, a very important part of this story is [guitar repair expert] Gary Brawer. I had been bringing my guitars to him for a long time, complaining and telling him, 'I need to be able to hit the strings hard, play classic blues licks, but I also need to be able to play these light-fingered legato things - and I need to do this two-handed tapping stuff.' If we set the action up high where the blues stuff sounded really good, then the tapping was unbalanced, so we had to lower that. But if it got too low, then the traditional guitar stuff didn't sound big enough. "There's no way around some of that stuff. I think when you're making records, you have different guitars set up for different jobs. What Gary helped worked out was the question: 'How can we adjust the action so that it's the same from the first couple of frets all the way down the neck to the 17th, 19th frets?' We took a lot of knowledge and technology from those sessions, and then we brought it all to Rich at Ibanez to work on a neck that would allow us to do that. "It never really clicked until Surfing was out, and I got a real chance to woodshed with that guitar. The first thing I recorded with it, I think, was The Crush Of Love. I did that and a version of Power Cosmic for a Guitar Player flexi-disc. We recorded that right around late '87. The album started taking off, and I had this new Black Dog prototype in my hands, and I started to tour with it." At what point did you feel that Black Dog could work both live and in the studio - that you didn't need separate sets of guitars? [laughs] "The funny thing is the whole idea that I would have enough guitars to say, 'OK, these are live and these are studio.' [laughs] That's a great notion, but back then I only had about three guitars. That was it, so whatever I had came with me, unless it was the Kramer, which was so delicate. I don't know what kind of wood they used, but it was so soft. It didn't seem to sound good live; it only sounded good if you had an hour to work on microphone placement. "A lot of stuff that I had been recording prior to that was done with these Boogie Body guitars that I had put together. I had one that really survived my early years in Berkley, California, which was a very unusual one made out of hard rock maple, and it had a universal route, and I had four or five pickguards made that I could just pop in and out - it was a Stratocaster shape. I made the first two albums with that guitar. If I wanted to record something with a whammy bar, I'd use the Kramer. "But I didn't want to bring those guitars out, and I think that was the main thing behind the Black Dog - it was the beginning of the idea that there would be one guitar that could do it all." "Oh man, once I started sessions for Flying In A Blue Dream, that was the guitar. I used it on everything, every single song on that album. To me, at that period, the guitar had reached its newest form of perfection. I mean, it had always been this little, beat-up guitar that had so much surgery done on it. "We kept trying to figure things out like, 'What do we do with the pickups? What do we do with the pots? How much can we shield? What kind of wires can we use to connect all the electronics?' The newest bridge from Ibanez was put on, the frets were a different size, the neck had been shaved, the radius had been changed, the nut had been changed - and, of course, it had been scribbled on a million times. "I must have had Gary change the length of the vibrato so many times. And he was bending them, as well. Generally, bars tilt up at the end, and I wanted them straight, so all my bars were shorter and straighter. "It wasn't this beautiful, clean-looking piece of work - it was tough. But by this point, we had really perfected Fred. You can hear it on the Flying In A Blue Dream album. The opening harmonics were so easy to get. The neck pickup was the PAF Pro. I don't think I changed it until I came up with the PAF Joe." "I think I might have thought, I don't want to stand here with a black guitar - that'll look kind of boring. [laughs] I had always been toying with working some kind of goofy art into what I was doing. Because the guitar was such a prototype, we were all thinking, The real one's coming… But once I started doing it, I said, 'Hey, that looks kind of cool.' So I kept doing it. "As my success blossomed during that period, one thing was also clear - that I wasn't part of other guitar players' scenes. Tthey were coming from a really heavy metal place. I wasn't trying to blend in with Jason and Marty or Yngwie - that wasn't my thing at all. So by drawing on the guitar, I distinguished myself as an artist who was going to be a lot quirkier. "Some of us were introduced to these new paint pens, these glitter pens from Japan, and it just seemed fun to use them. I'm sure I was just looking in my sketchbook and I thought, Hey, that'll work. [laughs] But it's funny, it didn't wind up being iconic until the Flying In A Blue Dream photo sessions. I asked the photographer to take some shots of just the guitar, and that became the album's back cover. After that, people asked me about the guitar all the time." "After every performance some of it would come off. Wherever my arm was rubbing, it would get rubbed off. I was adding stuff to it during the boring parts of the day on tour, whenever there's nothing to do. "The guitar was stolen for a period of days, and during that time, all of the scribbling was rubbed off by the thieves in an effort to disguise it - or 'undisguise' it. When I got it back, I was so disheartened that I retired it and didn't draw on it for years. I have to say, though, that by then the guitar had really started to suffer from being worked on too much. It's almost like it had scar tissue from too many things being done to it, particularly the neck. It had too much plastic surgery. [laughs] But all of the work we did on it got us to the JS neck, which to me feels so comfortable and produces such a great vibrato tone. It's the perfect neck that allows you to play vintage-sounding stuff along with modern stuff." "I don't know. I don't know when [guitar tech] Mike Manning and I started giving the guitars names. It was probably at one at a show somewhere and we were having a laugh." "Suddenly, it's Black Dog. I think we might have had a White Dog, but it just wasn't as funny." "I have to think about this. [pauses] Did I use it on Live In San Francisco?... I'm looking at my computer right now at live clips… I know that I brought it out on The Extremist tour, which was '92, '93. I did a small amount of touring in and around the Deep Purple stuff, which was the end of '93 going into '94, which was the Time Machine release and The Beautiful Guitar compilation in Europe. Do you miss playing it? Do you ever pick it up at home, just for nostalgia's sake? "I do, but I don't think I've played it recently. I can't remember the last time I used it. I haven't played it for a live performance for some time, so we definitely put it away at some point." Note: Joe Satriani will have a brand-new online store very soon that will include one-of-a-kind items designed by Satriani himself, limited-edition autographed items, plus some classics from the past. In addition, there's VIP packages for the South American G3 shows with John Petrucci and Steve Morse (and Petrucci and Steve Lukather). Click here for details.